firstly the writer obviously has no financial training and have no understanding of market caps..
to call cryptos ponzi, dont mistake consensus money as ponzi. every ponzi scheme has a top guy to make money and run away. icos normally have smart contracts to lock the fund until a few years and released after the projects are completed. the writer has also failed to realise that gold is the biggest ponzi scheme ever and total market cap of this ponzi scheme is already 7 trillion. in order to make money from gold investments..one needs to create demand and because of demand and new people coming in.. then only the value of gold will rise.. isnt that ponzi scheme? so the writer has already accumulated all the gold he need and now he is on the top.. the newbies who come in buying gold will prop the price up thus the writer will make money by his gold valuation. bitcoin really doesnt need such pathetic hard selling..
the technology sells it self. blockchain technology is highly disruptive. the most disruptive tech in our day and age.. so to compare cryptos rally with the tulip mania is really amateur. the arguement that nothing backs cryptos are wrong.. it is the first real publicly verifiable consensus money. it has gone viral not because of speculations but because people has realised that this is the real tech honest money. Nothing backs gold.. to say that having a long history of being money is not a strong arguement for gold to be money. 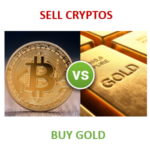 Gold only has value because everyone says gold has value.. they could have said aluminium has value.. so gold is backed by nothing but cryptos are backed by consensus, utility cryptography and cutting edge technology. It is easy to fake a piece of gold but it takes 32 billion us dollars to create one fake bitcoin that will only allow a few minutes of double spending before the system kicks u out. if writer says sell cryptos and buy silver.. that i would agree cos silver has utility value but to sell cryptos for a ponzi like gold . abit hard to swallow. Is rsspost a bot or something? crypto may have given some of us here sudden wealth in 2017.
i suspect sudden wealth may come to silverbugs soon.